"Scarlett Johansson has abandoned her reputation as a progressive celebrity in exchange for the money that accompanies becoming the new face of Israeli apartheid. Just like the few artists who played Sun City during South African apartheid, Johansson will be remembered for having stood on the wrong side of history." "This controversy has shined a light on the fact that SodaStream is at the heart of Israel's system of occupation, colonisation and apartheid. 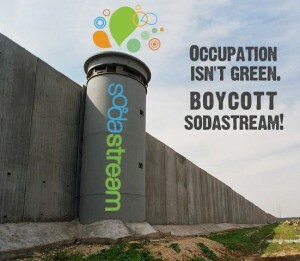 Retailers that stock SodaStream can no longer claim they are unaware of the role the company plays in Israeli violations of international law and consumers across the world will now see through SodaStream's claims to be an ethical company." "Oxfam's statement today that Johansson's support of SodaStream was incompatible with her role as an Oxfam ambassador is very welcome, but the great length of time that it took for Oxfam's leadership to reach this conclusion has disappointed many Palestinians, people of conscience across the world and Oxfam staff and supporters. We hope Oxfam will implement its opposition to illegal Israeli settlements in a clearer way in the future." "We thank everyone who stood firmly with Palestinian rights and joined the social media campaigns and took other steps to put pressure on Scarlett Johansson and Oxfam to do the right thing."